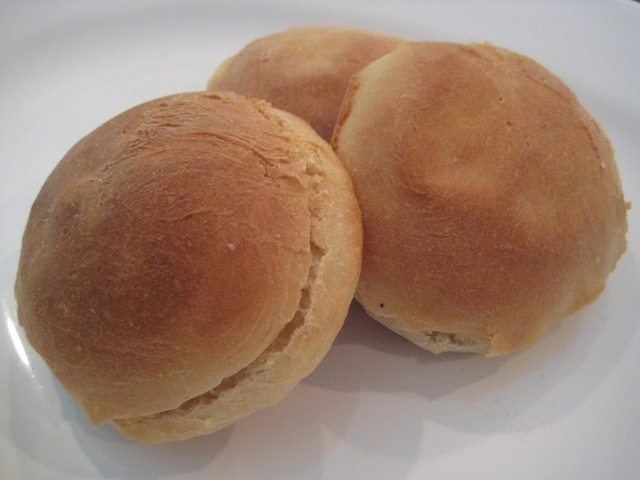 Day 3 – Hamburger Buns etc. While Day 2 started out well enough (the flatbread pizza was yummy), things took a turn for the worse mid-afternoon. I had planned a big cooking day, but was very low on milk and had only one egg. These items were coming in the day’s food delivery, but I had no idea when they would arrive. Expecting family for dinner, I was considering several meal options: homemade pasta with a choice of tomato or pesto sauce, veggie burritos, or hamburgers and salad. Lack of eggs knocked out the pasta (as did lack of tomatoes which were also in the shipment) and lack of milk knocked out the tortillas…so hamburgers it was. All was going well until the faucet on our kitchen sink snapped off. With a kitchen full of dirty dishes (one of the side effects of cooking from scratch is a lot dishes), we set out to replace the faucet. Not a bad plumbing project, except that the only hardware store in town was destroyed in April by a tornado . Patrick was able to procure a new faucet from the next closest Lowes andinstall it most of the way, until we discovered that the connecting hoses were too short. Dinner was now less than two hours away, the kitchen was an absolute disaster, and we need to go back to the not-at-all-nearby hardware store. At this nadir, we rescheduled our dinner for the next day and set out to Pittsboro. Soon all was better: a stop at the Chatham Marketplace yielded some local Caraway Cheddar cheese, delicious with my fresh baked foccacia (our replacement dinner); a stop at Food Lion yielded dog food for Luna and beer for us, and in short order, the sink was repaired, new and improved!! We also had two nice discoveries: the highly useful Basin Wrench tool and a recipe for making tasty, light hamburger buns (be sure to follow the advice in the comments regarding the yeast). May the rest of Day 3 be uneventful!